An original and pleasantly demanding puzzle-style game that leaves you wanting slightly more and slightly more variety. Elena Romanovska wants to enter the great nation of Arstotzka. My country. All of her dates look good: DOB, passport expiration, entrance deadline. Her verbal explanation for entering matches what's on the work permit, which definitely wasn't forged. I flip through my guidebook to verify the passport's issuing city—check. Her listed weight mirrors what I see on my scale, so she probably isn't a smuggler. Everything's in order. I knock the green “APPROVED” stamp over the top page of her passport, push her documents back through the slot, and my workspace clears. Oh god . That was her. Elena was on today's “wanted criminals” list from the Ministry of Admission, which I'd accidentally buried underneath her pile of documentation. It's my third mistake of the day, so I'm fined on the spot. That's five fewer dollars that I'll have to pay rent, to keep the heat on, to feed my family. 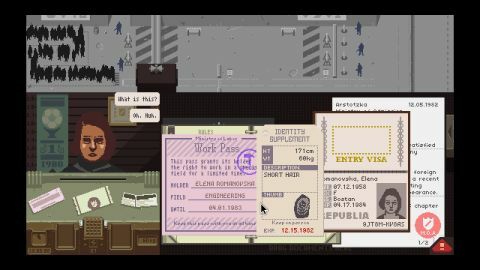 Papers, Please is the intersection of efficiency and intrigue. You're an immigration checkpoint officer for a fictional, pseudo-Soviet state in 1982, and it's your job to vet the foreigners and returning natives who want to cross the border. You do this by scrutinizing their personal documents for inconsistencies—expired forms, faked ID photos, mismatched fingerprint records. A paperwork sim might sound mundane, but spotting a mislabeled gender or a forged stamp produces real pride, and Papers, Please keeps boredom at bay by gradually introducing incentives for bending or breaking the rules. Checkpoint guards offer to slip you extra money if you detain more people. A drug smuggler will offer you a bribe for letting them across the border. A wife without an entry form might plead to be let through so she can be with her husband. These interactions disrupt the pleasant, analytical brain work of scanning and stamping paper. Over time, plot lines emerge from characters and factions that test your empathy and loyalty, at the center of which is the well-being of your family, who depend on you for money. Each workday terminates with a score screen where your earnings, penalties, and bribes are tabulated alongside your expenses. Food, rent, heat, and medicine all cost money, but you probably won't be able to afford everything without taking bribes or if you're making too many mistakes at your post. The mental-emotional tug-of-war the game manages to stimulate through paperwork is impressive, but a lot is owed to its perfect pacing. The set of rules you're mandated to judge people by, and your tools for doing so, grow in parallel with your competency. United Federation citizens might be prohibited one day. You might receive orders to confiscate certain passports. A new type of form might be required. It's thoughtfully balanced in a way that stays just a step ahead of you in difficulty as you become a more efficient bureaucrat. My enthusiasm for Papers sank a little when I realized how much the game's interesting characters—like a recurring encounter with the members of a secret organization—are scripted in to appear at set moments. Replaying Papers' early stages a second or third time unavoidably feel like busywork as a result, as you're stuck doing elementary checks on basic forms. In these ways Papers simply shows the limitations of being a game made by a single person. There are 20 discrete, Choose Your Own Adventure-style end states for the story, but some are small variations, and not all of them have unique art to express them. Likewise, your family, the crux of your motivation, is only represented with text, a missed opportunity to get more emotional investment out of players with, say, a depressing, pixelated depiction of their ill mother-in-law. An Endless mode alleviates some of Story mode's monotony by letting you compete on leaderboards for prestige, but above all Papers, Please is a $10 ticket to emotional manipulation, left brain stimulation, and elegantly-paced virtual paperwork wrapped in clever storytelling.